In Mexico, Ms Lourdes Reyes has developed a technique for preparing unique three-dimensional jellies. 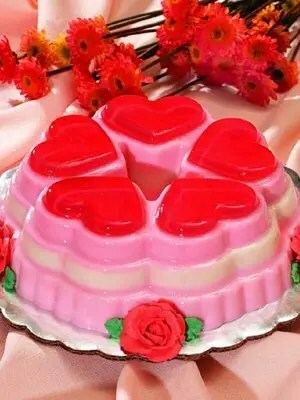 These attractive gelatine based desserts have at their centre a colourful jelly-feature encased in flavoured gelatine. For example, the central handmade feature can be a flower of your design—you are only limited by your imagination. Some days ahead, start keeping the egg shells. You should make a hole in the larger end to empty and wash them. Hydrate the gelatin. Pour the gelatin into ¾ cup of cold water, and whisk quickly with a fork or wire whisk. Stand for about five minutes. Boil 5 cups water with sugar. When boiled, remove from heat. Add and dissolve the hydrated gelatin in the boiled water. Separate 4 cups of water/gelatin mixture and add powdered milk and vanilla. Separate 2 cups of this mixture, tint with green colour, and let set in a small mould or bowl in the fridge. Combine the remaining cup of the clear gelatin with the cherry flavour. Separate into three portions and colour each in yellow, blue and burgundy. Put the egg shells in an egg container, so they don’t move. Pour about 1 tbs. 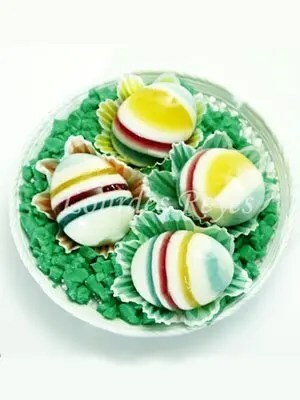 milk gelatin into each egg shell. Refrigerate until set, then pour 1 tbs. of 1 colour gelatin, and let set (approx 15 min). Repeat, pouring milk gelatin, followed by the second colour gelatin, etc. until the egg shells are full. Refrigerate about 6 to 8 hours. Then, carefully break the egg shell as you would do with a boiled egg. Mash the green gelatin. Put it in a plate or basket and then place the gelatin eggs over it. Immerse the gelatine in 1 cup of cold water mixing quickly with a wire whisk or fork and let hydrate while you prepare the following steps. Combine 8 cups of water with the granulated sugar and bring mixture to boil. When done, remove it from the heat. Let stay about 5 minutes. Dissolve the hydrated gelatine in the boiled water and sugar; stirring until no foam remains in the liquid. Let it cool and blend with the cream cheese and lemon juice. Leave mixture thicken and then fold in the whipped cream. Tint one cup with red food color and pour into the moistened mould. Chill until set. Add pink color to 6 cups of the mixture and pour 1 cup over the first layer. Chill until set. Pour 2 cups of white mixture over the pink layer and let set in the fridge. Pour the rest of the pink mixture over the white layer and chill until set. Un-mould and garnish with whipped cream roses or as you wish.